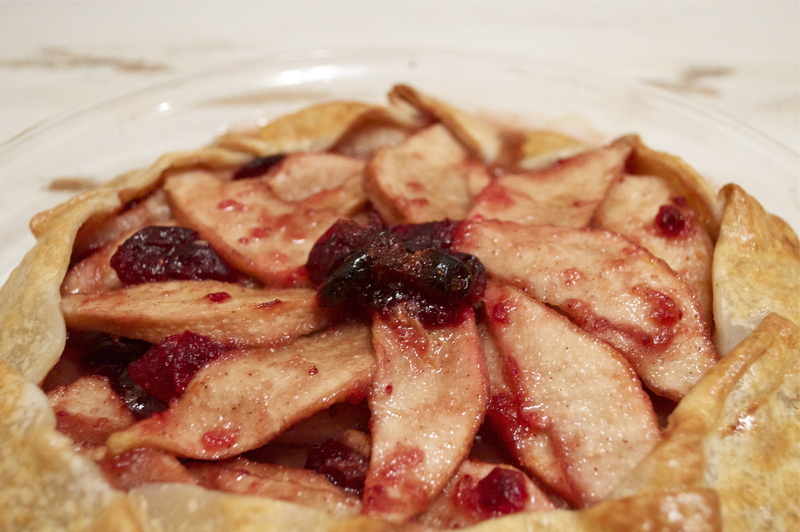 Adding a cranberry compote to sweet, cinnamon pear filling makes for a quick and easy dessert that lives up to its name! Let me just start out by saying, I have never liked pears. They are basically just a mushier, less flavorful apple. Of course, I may also harbor a little bit of extra angst toward this fruit because I happen to be shaped like one, but seriously, I don’t like them. I’m not big on berries either, so imagine my joy when I looked in my fridge and saw nothing but a bag of fresh cranberries and some old pears. 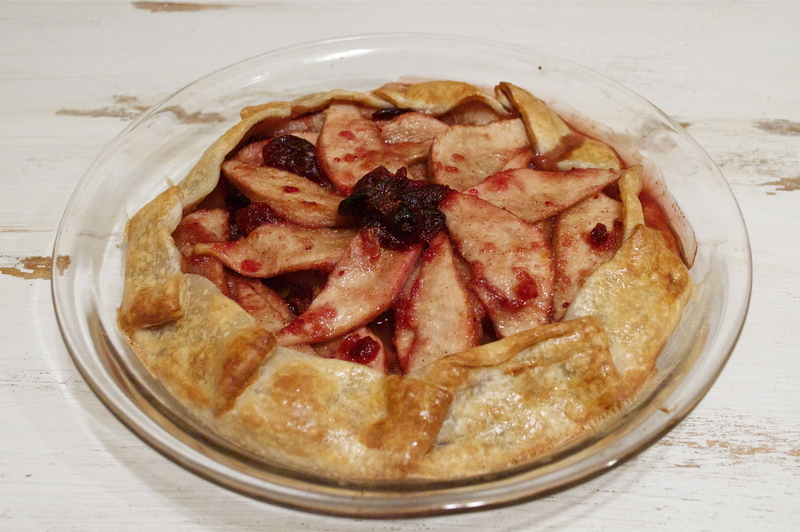 But after tasting this simple, fruity dessert, I am officially a cranberry and pear convert. Hallelujah! 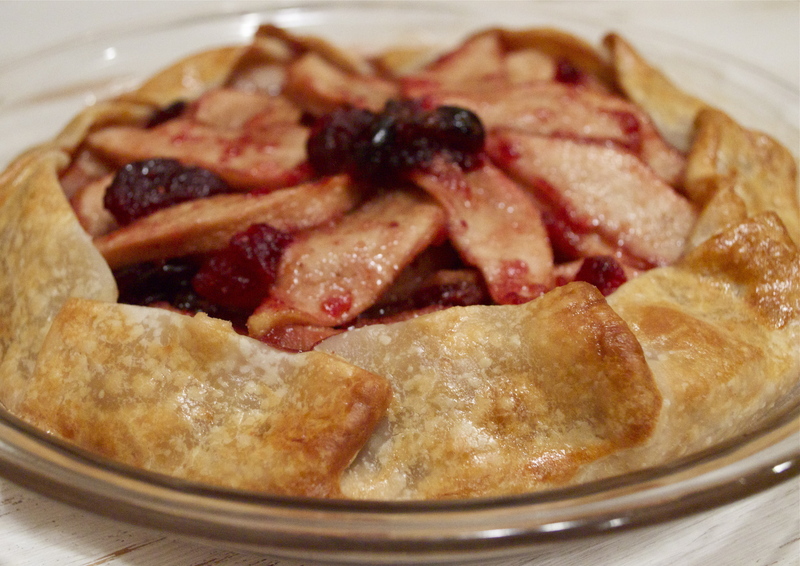 Not only is this tart is delicious, but it’s packed with fresh fruit. That makes it healthy right? Probably not, considering I ate my slice with a heap of vanilla ice cream on top. But without the ice cream, I’m sure it’s super healthy (read: slightly less fattening). If you do want to try a lighter version of this recipe though, checkout this link to make your own whole wheat pie crust! To get started, place a small saucepan over medium/low heat and fill it with the orange juice, sugar, and cranberries. Stir the mixture gently until the sugar has dissolved. Then add the nutmeg, clove, cinnamon stick, and orange zest. Reduce the heat, and let the mixture simmer until the cranberries have burst and the compote has thickened (about 20 minutes). Meanwhile, place a thawed pie crust in a pie dish, and prick holes in the bottom with a fork. Next, preheat the oven to 425°F. While the oven is preheating, slice your pears and place them in a large bowl. Add the lemon juice, brown sugar, and cinnamon. Next, add the cranberry compote to the pears, and mix until all the slices are evenly coated. Place the filling in the pie dish, leaving a two-inch boarder around the edges. Next, fold the boarder inward and brush the crust with an egg wash (a lightly beaten egg mixed with a splash of water). Let the tart bake for 15 minutes. Then adjust the heat to 350°F, and let the tart continue to bake for another 35 minutes, or until the crust is golden brown. Before serving, mix honey and hot water in a small bowl. Brush the crust and drizzle the remaining honey mixture over the center of the tart. Serve warm, and (preferably) with a scoop of ice cream! Enjoy!